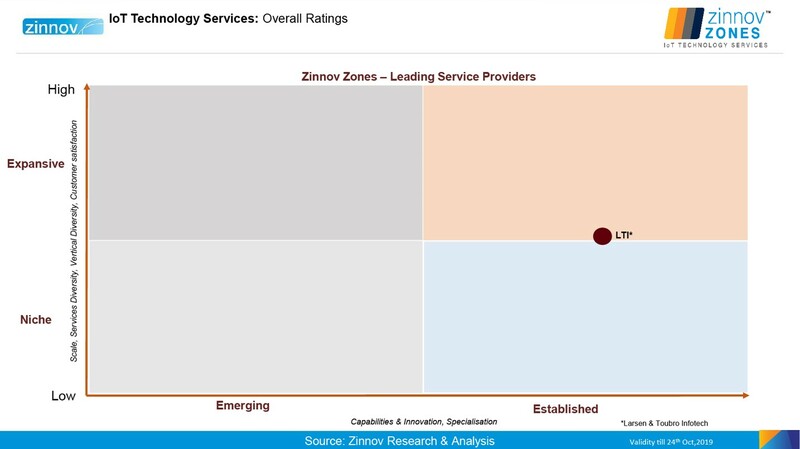 Mumbai, November 05, 2018 – Zinnov positioned Larsen & Toubro Infotech Ltd. (NSE: LTI, BSE: 540005), a global technology consulting and digital solutions company, in Leadership Zone in the overall IoT Technology Services ratings, as well as two sub-segments, Managed Services & Support, and Predictive Maintenance. Zinnov Zones for IoT Technology Services is an annual rating from Zinnov, which enables global business leaders to make informed decisions in partner selection across geographies for all their IoT products and services initiatives. The report assesses IoT services capabilities across 3 key areas- service lines, competencies, and IoT-enabled use cases – and provides leaders an informed perspective for accurate partner selection. LTI’s proven expertise in IoT-enabled digital transformation, and its ability to scale up to meet the clients’ business needs across industries, makes it an ideal partner for enterprises globally. This Zinnov recognition reiterates the innovative streak that LTI nurtures, which powers its clients’ business processes toward excellence.